Please note: There is an additional $10 fee for dogs weighing 100 lbs or more. We accept credit cards (Visa, Mastercard, Discover) and cash. Anyone from anywhere is welcome. Come one, come all! First, schedule an appointment (click here). 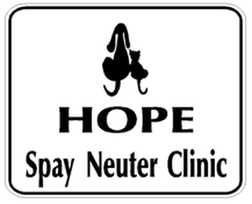 HOPE Spay Neuter Clinic is open on Tuesdays from 7:30am to 6:00pm. You see our rates above. Please consider donating to help us keep our prices low. ​Any amount helps. Thank you!